"eShop for RA" is not separate theme. This is the add-on to the theme "Red Agency", which expands the possibilities of this theme. 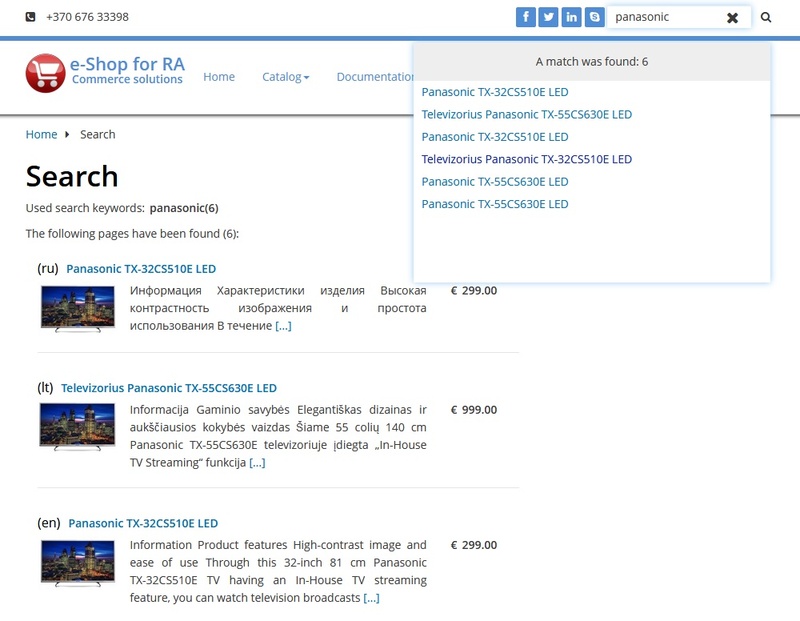 Add-on "eShop for RA", by using appropriate plugins, will allow you to create fully-fledged e-commerce sites (catalogs, shopping basket and so on). Similar to those that used by specialized e-commerce CMS (as PrestaShop, Magento, ZenCart and others). Download "Red Agency" theme installation archive, for example from here. Extract file to your sites directory theme. Download "eShop for RA" installation archive and extract the contents to your sites directory "Red Agency" (eg. theme /Red Agency/), overwriting the existing files. Activate all plugins included with theme "Red Agency". Activate the theme "Red Agency". Go to the theme administration page and make the required settings. For catalogs organization need to download and activate the following plugins: I18n Base, I18n Special Pages and I18n Search. 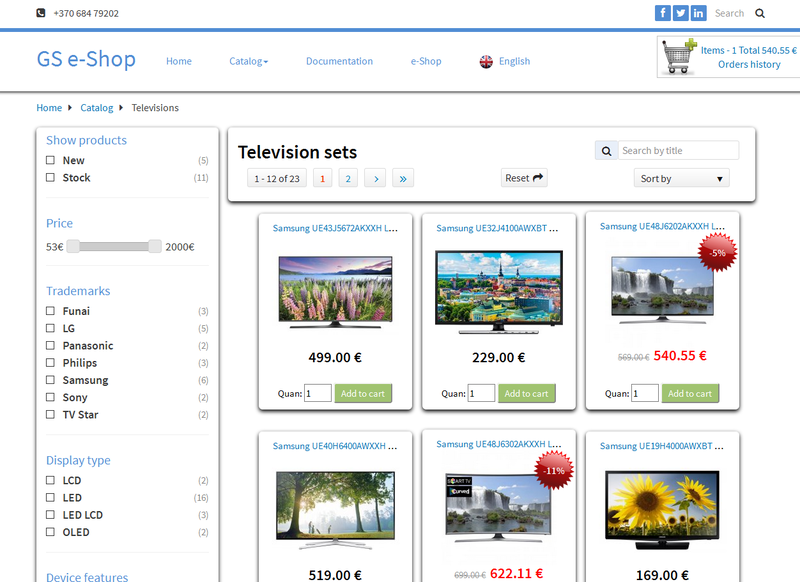 For shopping basket using will need to download and activate the plugin "Basket plugin MOD", for example from here. Activate the plugin. Make the necessary settings on the plugin administration page (tab Plugins button "Cart settings"). If you want, you also can import the necessary special pages settings for TV and / or Laptop types (buttons below). For catalogs extended filtering engine creating need to download and activate the plugin "Search Widgets", for example from here. Plugin settings and detailed description are on the tab Pages button "Search Widgets settings". If you wish, you can import to your site Demo data structure. This requires extracting the demo file contents to the respective directories of your site. Then it is necessary to recreate the search indexes, in order go to the tab Plugins button "Configure I18N Special Pages", select any type of special pages (eg. LAPTOPS) and press the button "Save Special Page Type". Note! If you plan to use the demo data pages need to prepare the file fields, which stored used image links, to work with your server (change links addresses). For this job you can use the plugin Migrate ver. 0.3, which will replace all references addresses automatically. Besides, special field images should be sent from tab Files with standard GS Uploader. Then be made correct thumb file (with "thumbnail." append prefix). So, if you use other file transferring tools - images rendering can be inaccurate. In the nearest feature I make changes which will allow to use another file extensions for thumbnails. Add Auto-suggestion mechanism - it's begin to work when input 3 or more characters.Output displayed in the special DIV like Page Title with link to this page. Improved Search page provided information: On top displayed searched keywords; Removed short-codes and illegal characters; Improved text Excerpt mechanism. To the upper right Search field add submit button and Clear button for mobile users convenience. Always use internal Search function - if checked will be used Internal Search function, even if on site is installed "i18n_search" plugin. Turn on Auto-suggestion Search - (turn on / off Auto-suggestion). Search the keywords in the 'Meta' fields - (if checked search try to find also in the "Tags & Keywords" and "Meta Description" fields). Open the found page in a new tab - (if checked found link will be opened in the new Tab). Search keywords condition (logical AND) - if checked search try to find whole row of keywords, if unchecked search try to find each keyword separately. Search Page excerpt size (in symbols) - you can change Excerpt value, if empty used default value 200 characters.